By Ryan Whitwam on Nov. 22, 2010 at 10:30 a.m. Between Google I/O and some recent developer updates, the Market is going to look radically different in the near future. We've long held that Google needs to make some changes to the Android Market before it can be the truly great app discovery and sales platform we know it can be. Back at Google I/O, some noise was made about what the market would become sometime after Froyo. With Gingerbread on the horizon, we believe change is coming to the Market. Just recently, Google updated developers on some changes to their developer console that will affect how the Market works for you. email to developers outlined the changes, and there are some surprising and interesting things in there. First off, Google will start requiring a "feature graphic" on all apps. This is to be a 1024x500 landscape graphic akin to a splash screen. This is odd, as 1024x500 is not a standard smart phone resolution. The app icon is going to be upped to 512x512 in resolution, and Google took the opportunity to remind developers of the Android icon design guidelines. In addition to changing the rules for icons, at least on screenshot, at native resolution is required. The interface allows 2 right now, but that is being increased to a maximum of 8 screens later. The last bullet point for developers is the inclusion of a YouTube link. Developer can optionally include a link to a YouTube video of their app in action. This is huge for the Market interface. There a lot of times having a video demo could make users more likely to buy an app. We occasionally see YouTube links embedded in the app description. But the content in the Market description is no clickable. So users would have to type in the URL manually. That's not a great experience, and no one bothers to do it. These confirmed changes are going to affect how you deal with apps on your phone. For one, the app icons on your phone will look much more polished and attractive on high-res screens. We're not sure how that feature graphic will be implemented, but there are two options. One is that the graphic would be used for a special Market presentation in tablets. Another is that the upcoming Android Market web interface will utilize these larger graphics as banners (more on that below). Either way, it could add some much needed polish to the Market on a larger screen. The requirements for screenshots is a welcome change in our book. It's surprising how many apps have no screens. This will help root out fake and poor quality apps faster. Moving up to 8 screenshots will be very useful in evaluating apps. Although, we're not sure how they will display the thumbnails on phones. This is probably another change better suited to tablets and the web. We expect the new features to roll out with Gingerbread in the coming weeks. Google showed off a lot of new features at Google I/O. In the haze of post-Froyo brain-freeze, we almost forgot about what Google's Vic Gundotra said about "beyond Froyo". We got a first look a full version of the Android Market running in a browser. If you go to the Market site right now, it's a pretty useless site. But what they showed us at Google I/O was great, and we're hoping to see it soon. 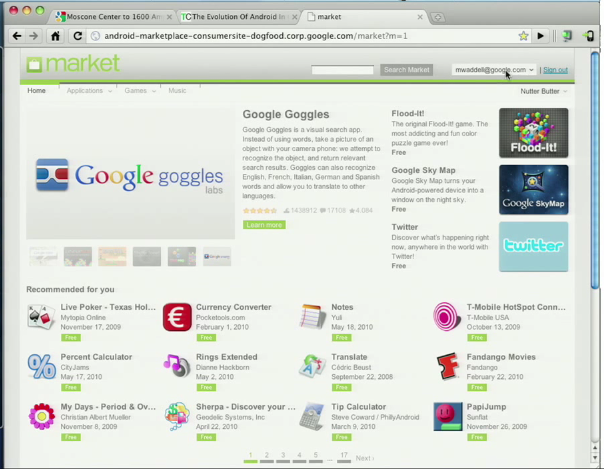 The I/O demo showed this site giving users the ability to browse and search for apps. There was a featured app ticker at the top as well. The Market site lets a user sign in and register their Android device. This allows the Market to push purchased apps from the web interface over the air to the phone. we also caught sight of a personal recommendation area. 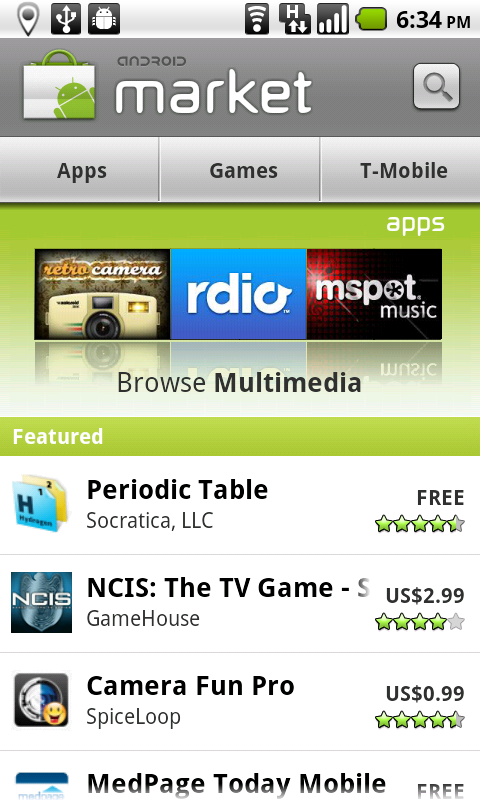 This is a feature duplicated by AppBrain with their Fast Web Installer, but it only works with free apps. Google's recent market update disabled the AppBrain method, so we must be close to something. Presumably Google's solution will work with everything. The other big change to the Market by way of this web interface is music purchases. Google was maybe a little vague about exactly how users were going to be able to buy music in the Market, but Vic was clear: the Market isn't just going to be about apps. The same slick OTA downloads of purchased music tracks were shown off here. It's easy to get down on the Android market for its presentation. Apps are hard to find, and the website is terrible. That's why so many third-parties, like AppBrain, have worked to improve the experience. We would love to link to a Google index of apps when recommending them, but instead we're using AppBrain. 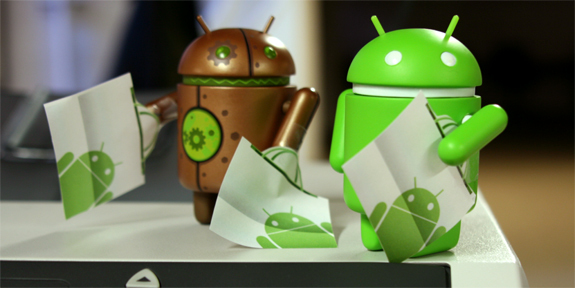 All the change coming to the Android Market could be great for the platform, but it is long overdue. A Gingerbread announcement is expected in the next few weeks, and that's when we expect to see changes roll out in the Android Market. Often, new Market features come with a new version of Android. But Google has shown an ability to update the Market features in some ways. They recently brought Froyo-style updating to 2.1 phones. When do you think we'll see the Market get updated? What do you think is in store for the store?